Health recommendations are encouraging us to eat a more plant based diet. 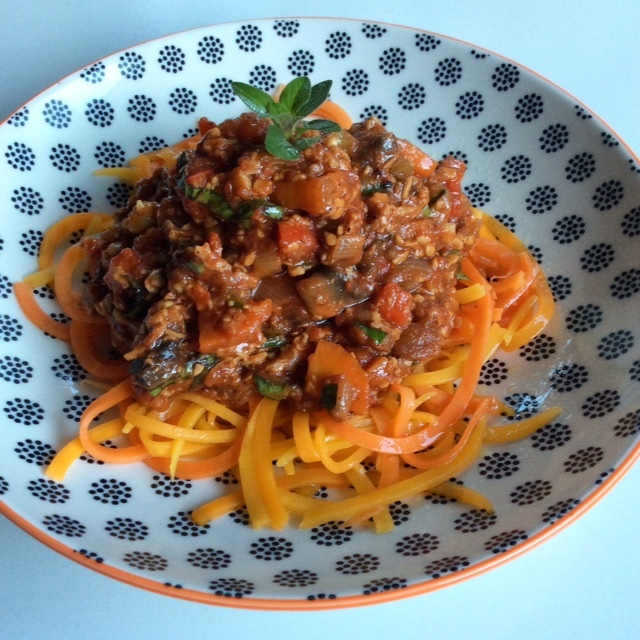 Looking for a meat-free alternative recipe for bolognaise? Try this tempeh bolognaise recipe. It’s completely vegan / vegetarian, a good source of protein and vegetables. FYI, tempeh is a vegan protein source made from fermented soy beans, learn more about it and the difference from tofu here. 1 x 400g tinned finely chopped tomatoes, I used Solo Pomodoro Mutti as this only contains tomatoes in the ingredients which means the tomatoes are ripened to have good sweetness and no additives are added. Heat a large non-stock frypan on medium high heat and add 1 tsp oil. Once oil is heated, add the eggplant and mix well to disperse the oil and cook stirring occasionally for 2-3 minutes. Add the onion, garlic, tempeh, 1/2 teaspoon salt, pepper and stir well. Cook for 5 minutes, stirring occasionally. Add all remaining ingredients, including the dried oregano and 1/4-1/2 teaspoon salt, except the basil, tinned tomatoes, tomato paste and stevia/sugar. Stir well and cook on medium heat for 7-8 minutes, stirring occasionally. Add the tinned tomatoes, tomato paste, water/stock, stevia/sugar and combine well, cook until the sauce has reduced to almost desired consistency, add basil and mix through cooking for a further 1-2 minutes. Taste for seasoning, adjust if necessary. Serve over cooked pasta, quinoa, legume beans (4 bean mix, kidney beans, lentils, chickpeas, peas etc) or if watching calorie/kilojoule intake serve over steamed vegetables, zucchini /carrot/pumpkin noodles (pictured) or Slendier spaghetti / fettuccine. Store tempeh bolognaise in fridge for 3-4 days (or freeze). campuscreators. gtublog. sewpopular. websitetestlink. myautomobiclass. miami-limo-services. cpmeiti. nflint. kiwiturk. 1222bets. brainteaser. shegoday. pleasureway. jzzk. gostreetart. jhroman. I appreciate the details on your site. Thanks a ton. Surprisingly user friendly site. Huge information available on few clicks. Good day, very good web page you’ve going here. Thanks regarding offering such amazing content. That could be the finish of this write-up. Here you will locate some web sites that we consider youll enjoy, just click the hyperlinks. Check below, are some absolutely unrelated web-sites to ours, however, they are most trustworthy sources that we use.